The county of Galway lies on the west coast of Ireland and contains the city of Galway and the towns of Athenry, Ballinasloe, Loughrea and Tuam. The east of the county is relatively good farmland while the west, known as Connemara, is rocky and barren. The major Gaelic families of the county were O’Halloran, O’Daly, O’Kelly, O’Flaherty, O’Malley, O’Madden, O’Fallon, O’Naughton, O’Mullaly and O’Hynes. From early times, the town of Galway was a prominent trading port. It was destroyed on several occasions by local raids, fire, and infringements by Vikings (Scandinavian sea-raiders who carried out attacks on Irish settlements between roughly the eighth and eleventh centuries). The Norman invasion of England commenced in 1066. Over a century later, the Normans turned their attention to Ireland, which they invaded in 1170. Following this, the entire Kingdom of Connacht, including Galway, was granted to the Norman noble Richard de Burgo. Yet the power of the resident Gaelic chieftains meant that de Burgo could only control the southern part of the county. The de Burgos fortified the town of Galway and established it as a major centre, trading with Spain and Portugal. By the fifteenth and sixteenth centuries, many of the Normans in the area had adopted Irish customs and the Irish language, although within the town of Galway itself they remained English in language and outlook. Following the defeat of Gaelic rebels in the Nine Years’ War (1595-1603), English rule was established more firmly in Ireland. In Munster and Ulster, land which had previously belonged to the native Irish was given to Protestant English settlers, by means of a system known as plantation. This prompted a rebellion of the earlier Norman settlers and the native Irish in 1641, during which time the city of Galway was a stronghold of the Catholic rebels. Following a nine-month siege, however, Parliamentarian troops (i.e. soldiers sent by the English parliament in order to suppress Irish uprisings) captured the city. There followed a period of famine and disease during which the population of Galway city and county suffered greatly. After the 1649-50 Cromwellian conquest of Ireland, Charles Coote, an English officer, was put in charge of Connacht, which he ruled from his base in Galway city. Following the accession of James II, a Catholic, to the throne of England in 1685, it was hoped by the Catholic population of Ireland that some of the land confiscated earlier in the century would be returned to them. However, England’s Protestant population refused to accept James as their monarch, instead choosing a Dutch prince, William of Orange. The rivalry between the two resulted in the War of the Two Kings, a conflict which was also known as the Williamite Wars: James’ supporters were known as Jacobites, while William’s were called Williamites. Fought for the most part on Irish soil, this war had a wider European significance: James’ ally was the French King Louis XIV, who was at war with William. The battle of Aughrim, centrally located in East Galway, was a key engagement in the conflict. Fought on July 12th 1691, it involved 45,000 soldiers from eight European nations, saw the death of the French general St. Ruth, and the defeat once more of the Irish Catholic forces. Their ultimate defeat in this war resulted in the exile of James II and the subjugation of the Catholic population to a Protestant minority, backed by the English crown. This was followed by the introduction of penal laws, designed to keep the Catholic population subservient to the Protestant ascendancy, and to reduce the Catholic bishops and clergy to manageable numbers. In reality, many of the laws were not enforced, and actual persecution of Catholics during the eighteenth century was not widespread, although they were denied basic privileges such as the right to purchase land, the right to bear arms and the right to sit in parliament. In Munster, Leinster and Ulster, the number of Catholic landlords and gentry declined sharply. In Connacht, however, the transfer of land ownership from Catholic to Protestant was never as fully implemented as it was elsewhere, with the result that during the eighteenth and nineteenth centuries there was a high number of Catholic landlords in Galway. During this time, Catholic places of worship were relatively scarce: due to the poverty of the majority of Catholics, there was almost no revenue for church-building. In the early to mid-eighteenth century, places of worship generally consisted of old barns or mass-houses. The latter were often shoddily-built structures, with mud walls and poor roofing. Mass was also said in the open air, sometimes near large mass-rocks. By the late eighteenth-century, the situation had improved somewhat: some of the penal restrictions on Catholic worship were relaxed, and the rise of a Catholic merchant class in the towns meant that funds for church-building were available. Yet most of this took place in urban areas. It was not until the 1820s and 1830s that a more widespread campaign of church-building was undertaken throughout the country. Many of the churches constructed in Galway county at this point are still in use today. It was during this period also that separate Catholic cemeteries began to be widely used. Prior to this, Catholics had not been allowed to have their own cemeteries, with the result that many were buried in Protestant graveyards. Fuelled by the dissemination of the tenets of revolutionary France and America, there was widespread unrest among the Irish population during the late eighteenth century. Agrarian violence escalated, and made some impact in Galway, although on the whole it was much less pronounced there than in the rest of the country. The unrest culminated in rebellion in 1798. 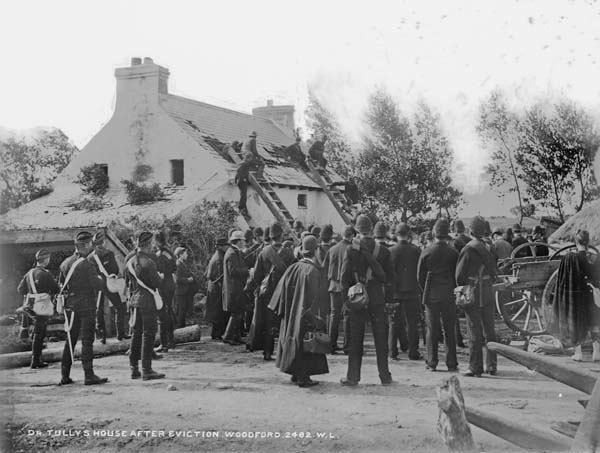 Again, however, most of the fighting took place elsewhere, principally in Wexford. By the early nineteenth century, traditional Gaelic customs, language and social behaviour which had persisted in Galway throughout centuries of war and conquest found themselves being eroded by more insidious foes: economic and educational progression, which went hand-in-hand with the advancement of English and the decline of the Irish language. This process of decline was greatly accentuated by the Great Famine of 1845-49, which struck the western parts of Ireland, including Galway, considerably more severely than elsewhere. More than anything else, this catastrophe had implications for the demographic condition of the county: in 1841, the population of Galway stood at 442,000: ten years later, the starvation and emigration prompted by the Famine had reduced this to 322,000. The section of the population worst hit was the Gaelic-speaking poor, which had tended to engage most in traditional custom. The acute emigration which followed the Famine continued throughout the second half of the nineteenth century, reducing the population of the county to 215,000 by 1891. It is only now that it is beginning to again attain higher levels. 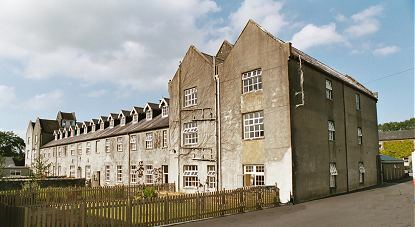 East Galway was notable for its high number of Catholic landlords. The affinity which existed between them and Catholic tenants meant that landlord-tenant relations in the Galway area were relatively good during the eighteenth century. However, the end of the Napoleonic Wars in 1815 precipitated an economic crisis which caused serious rural hardship. Small farmers and labourers were frustrated by high rents (which had been payable in more prosperous times) and other exactions such as the payment of tithes to the Established (Protestant) church. This led to the outbreak of violence throughout eastGalway in the 1819-1820 period. A secret organisation known as the Ribbonmen (so called because they wore crapes or ribbons as distinguishing marks) championed the cause of the rural poor. Operating mainly by night, they broke into houses, seized arms, and recruited new members by forcing them to swear oaths of allegiance. They threatened landlords who were deemed to be oppressive of their tenants by charging excessive rents, and they were involved in several engagements with the civil military forces. Illegal organisations of this type were by no means uncommon in late eighteenth and early nineteenth-century Ireland. With the help of the government forces, the landlords of Galway county succeeded in suppressing the disturbances of the 1819-20 period. However, landlord-tenant relations in the area continued to be tenuous throughout the eighteenth century. Evictions for non-payment of rent were particularly resented, and tenant agitation culminated in the land war of the late nineteenth century. Not a war as such, this was in fact a struggle to transfer ownership of land from landlord to tenant. By the early twentieth century, this objective had been almost completely realised.